Walking is a discipline; it takes effort. It requires patience and exercise, day after day. We have to forego many other paths in order to choose the one that leads to the goal. We have to keep that goal constantly before us, lest we go astray. Remembering the goal. Walking also demands the humility to be prepared at times, when necessary, to retrace our steps. It also involves being concerned for our travelling companions, since only in company do we make good progress. Walking, in a word, demands constant conversion. That is why so many people refuse to do it. They prefer to remain in the quiet of their home, where it is easy to manage their affairs without facing the risks of travel. But that is to cling to a momentary security, incapable of bestowing the peace and joy for which our hearts yearn. That joy and peace can only be found by going out from ourselves. It might be objected that to walk in this way is to operate at a loss, since it does not adequately protect the interests of individual communities, often closely linked to ethnic identity or split along party lines, whether “conservative” or “progressive”. To choose to belong to Jesus before belonging to Apollos or Cephas (cf. 1 Cor 1:12); to belong to Christ before being “Jew or Greek” (cf. Gal 3:28); to belong to the Lord before identifying with right or left; to choose, in the name of the Gospel, our brother or our sister over ourselves… In the eyes of the world, this often means operating at a loss. Let us not be afraid to operate at a loss! 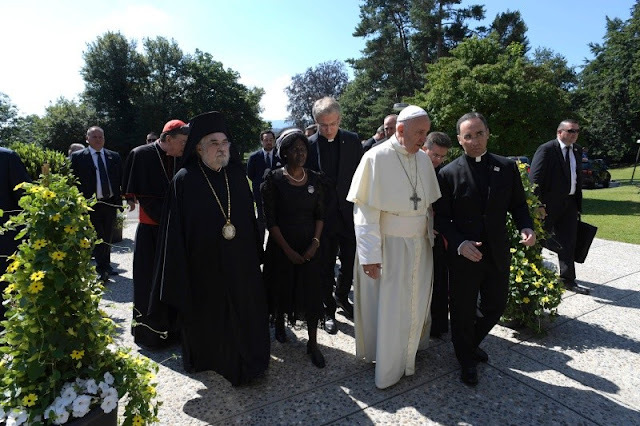 Ecumenism is “a great enterprise operating at a loss”. But the loss is evangelical, reflecting the words of Jesus: “Those who want to save their life will lose it, and those who lose their life for my sake will save it” (Lk 9:24). To save only what is ours is to walk according to the flesh; to lose everything in the footsteps of Jesus is to walk in the Spirit. Only in this way does the Lord’s vineyard bear fruit. As Jesus himself teaches, those who store up riches for themselves bear no fruit in the Lord’s vineyard, only those who, by serving others, imitate the “mindset” of God, who never stops giving, even to the gift of his very self (cf. Mt 21:33-42). Such is the mindset of Easter, which alone truly bears fruit. After so many years of ecumenical commitment, on this seventieth anniversary of the World Council, let us ask the Spirit to strengthen our steps. All too easily we halt before our continuing differences; all too often we are blocked from the outset by a certain weariness and lack of enthusiasm. Our differences must not be excuses. Even now we can walk in the Spirit: we can pray, evangelize and serve together. This is possible and it is pleasing to God! Walking, praying and working together: this is the great path that we are called to follow today. And this path has a clear aim, that of unity. The opposite path, that of division, leads to conflict and breakup. We need but open our history books. The Lord bids us set out ever anew on the path of communion that leads to peace. Our lack of unity is in fact “openly contrary to the will of Christ, but is also a scandal to the world and harms the most holy of causes: the preaching of the Gospel to every creature” (Unitatis Redintegratio, 1). The Lord asks us for unity; our world, torn by all too many divisions that affect the most vulnerable, begs for unity. Dear brothers and sisters, I have desired to come here, a pilgrim in quest of unity and peace. I thank God because here I have found you, brothers and sisters already making this same journey. For us as Christians, walking together is not a ploy to strengthen our own positions, but an act of obedience to the Lord and love for our world. Obedience to God and love for our world, the true love that saves. Let us ask the Father to help us walk together all the more resolutely in the ways of the Spirit. May the Cross guide our steps, because there, in Jesus, the walls of separation have already been torn down and all enmity overcome (cf. Eph 2:14). In him, we will come to see that, for all our failings, nothing will ever separate us from his love (cf. Rom 8:35-39). Thank you. Wonderful! Thank you, Holy Father!